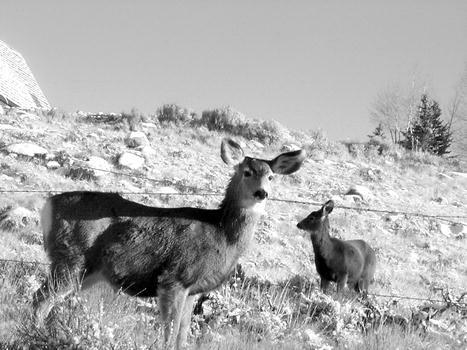 The Game & Fish is encouraged by the results of the December count of the Sublette County Mule Deer Herd. Biologist Doug McWhirter is especially pleased with this year's fawn to 100 doe ratio of 81 fawns - the second highest ratio in the last decade. In terms of the total deer counted, this year's total of 8,312 was less than last years total, but Doug points out that he flew over two hours less this year than last year. In fact, this year he saw 625 deer per every hour in the helicopter, the highest ratio in the past 10 years. Finally, Mr. McWhirter is very encouraged by the number of large bucks in the herd. Based on this year's count, 19% of the bucks in the Sublette Mule Deer herd have racks over 25" wide. Overall, Mr. McWhirter says the deer numbers are still increasing, "but we're getting closer to where we want to see the deer herd." The population objective for the Sublette Herd is 32,000 animals says Mr. McWhirter. Last year he estimated the population at 26,000 animals. He won't be able to make a population estimate this year until hunters return harvest surveys. Doug added that he's seeing a faster recovery of the deer that summer in the Hoback and northern part of the Wyoming Range than reside in the foothills of the Wind River Mountains on the Pinedale front.